Heat oven to 425ºF. Spray 12-inch pizza pan with cooking spray or grease with shortening. In large bowl, toss potatoes, 1/4 cup melted butter, 2 eggs, the flour and 1/2 teaspoon salt. Press potato mixture in pan. Bake 20 to 25 minutes or until edges are golden brown. Meanwhile, in small microwavable bowl, cover and microwave cheese product cubes and 2 tablespoons milk on High 1 minute; stir until smooth. Stir in Parmesan cheese and mustard until well blended. Spread 1/2 cup of the cheese sauce over potato crust; top with Canadian bacon. Cover remaining sauce to keep warm. Bake 5 to 7 minutes longer or until Canadian bacon is heated through. Meanwhile, in medium bowl, beat 6 eggs, 1/4 cup milk, 1/4 teaspoon salt and the pepper with fork or wire whisk until well mixed. In 10-inch skillet, heat 1 tablespoon butter over medium heat just until butter begins to sizzle. Pour egg mixture into skillet. As mixture begins to set at bottom and side, gently lift cooked portions with spatula so that thin, uncooked portion can flow to bottom. Avoid constant stirring. Cook 3 to 4 minutes or until eggs are thickened throughout but still moist. 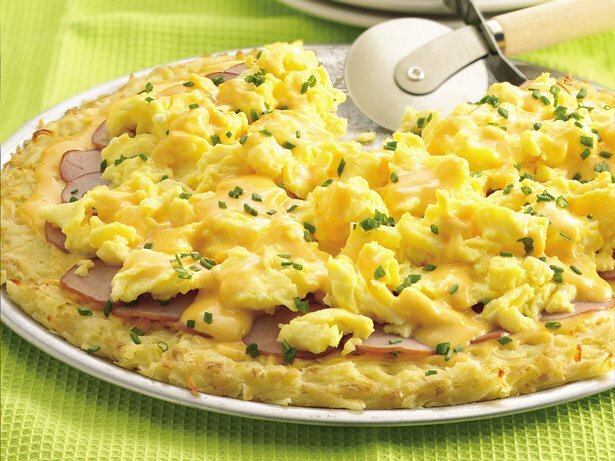 Spoon scrambled eggs over hot crust. Drizzle with remaining 1/2 cup cheese sauce. Sprinkle with chives. Use a spatula to lift servings from pan.